Himachal pradesh vidhan sabha election(Chunav) is going to be happen on November 2017. The current term of Himachal Pradesh Assembly is going to end in 2018. In this post you will know about candidates of BJP and Congress party as well as Opinion polls, Result, and interesting facts of Himachal Pradesh Assembly elections 2017. This election is major thing for Ruling congress party as well as Bhartiya janta party(BJP). So every party in state is preparing for coming elections. In Himachal congress party is oldest party ,first chief minister YS Parmar to Ram lal Thakur and Virbhadra Singh ,congress party have given several ministers and chief ministers. So congress will try to continue its rule in Himachal in coming elections. Bhartiya janta party is one of strong contender as a party to win in coming elections because in recent years Himachal citizens had given alternate parties government. Bjp is full of strong leaders like Shanta Kumar, Jp nadda, Prem Kumar Dhumal, Anurag Thakur, Satpal Satti etc. Himachal Lokhit Party also tried to make third front in last 2-3 elections but they always manages just one seat i.e. Maheshwar singh. But now Maheshwar singh have joined bjp again and it will be difficult to impact in coming elections. Aam Aadmi Party is also trying to make there presence in coming vidha sabha election in Himachal Pradesh. But they have no face in state except Rajan Sushant . It will not easy task them to fight against big parties like BJP and Congress. From congress party Virbhadra Singh is big face and was announced CM candidate by Rahul Gandhi in a Rally. Virbhadra Singh will be chief minister candidate of congress party but it was not easy for congress party as there were several issues of Current Chief minister with some more names like Kaul Singh Thakur, GS Bali and Sukhvinder Sukhu etc. But Congress party knows it very well if they want to repeat government in Himachal Pradesh they have to go with Virbhadra singh. His power in Himachal congress can be seen by this , congress party changed their policy one family one member because of Vikramditya singh. In thi election both Father and son are fighting election. Bhartiya janta party is fighting this election without any face, as they are fighting election on face of PM Modi. There is no Cm candidate declared for Vidhan Sabha election 2017. There are several leaders like Prem Kumar Dhumal, JP Nadda, Shanta Kumar and Anurag thakur etc who can be CM face if BJP wins in elections. Axis My India and India Today did opinion poll of Himachal pradesh vidhan sabha election in which BJP is looking to win election. This survey was conducted between dates 25th september to 8th October 2017. Acording to survey number of seats to all parties. According to this survey BJP can get vote share of around 49%. 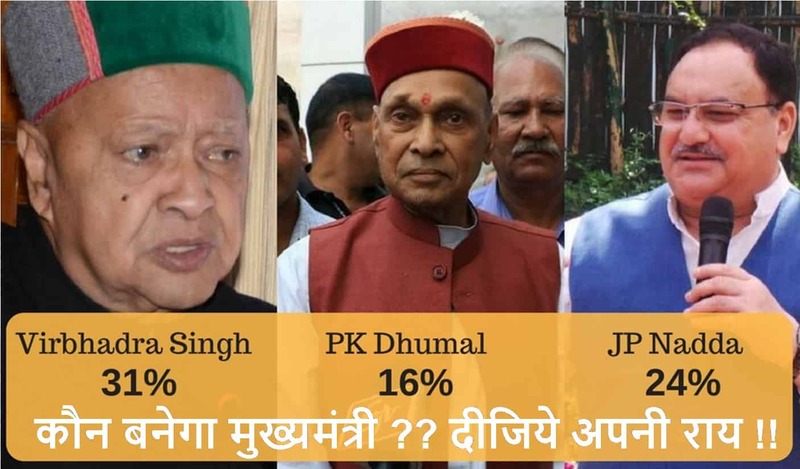 According to survey of India-Today and My Axis India Virbhdra Singh is first choice for the post of Chief ministe as 31% people wants Virbhadra singh as chief minister of Himachal Pradesh. In Survey People of Hijmachal Pradesh supported Demonetization step of Prime minister Narendra Modi. 59 % of people called Demonetization as good step and 48 percent people of Himachal Pradesh in survey are happy with work of Narendra Modi.